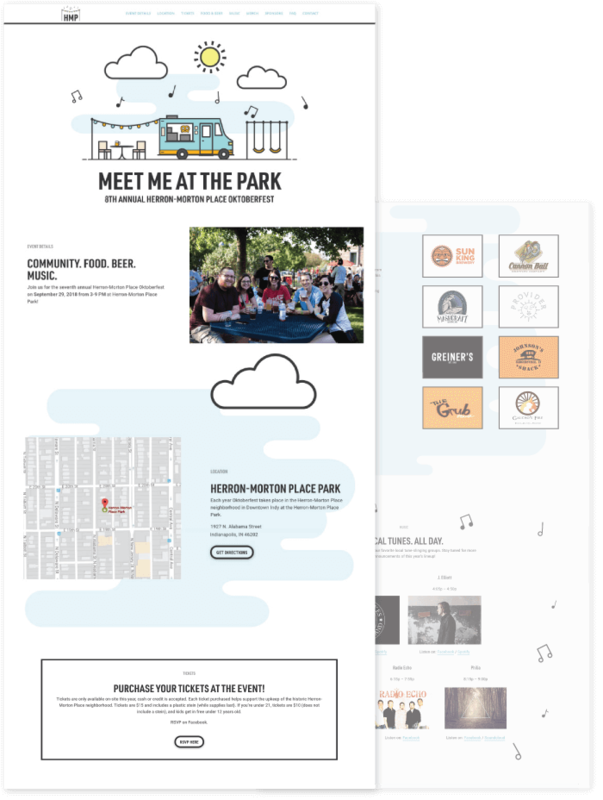 We partnered with the Herron-Morton foundation once again this year to create the branding, website, and collateral for the 8th Annual Herron-Morton Place Oktoberfest. The focus this year was on the neighborhood park, where the event is held. It’s a pillar in the community where neighbors regularly meet and spend time together. Neighbors often say “meet me at the park” when planning play dates for their kids or when they want to spend a nice evening outdoors with friends. We embraced this in the event branding, since everything in the neighborhood revolves around the park. The illustration in the logo incorporates aspects of the park as well as the Oktoberfest theme and event. Using elements from the main logo, we created secondary logos that were used for the merchandise and promotional materials. Since tickets were only sold at the door this year, the website was used purely for promotional purposes to get neighbors and community members excited about the event. We developed a sunny day scene and incorporated similar imagery throughout the website.